Adobe announced that Lightroom, as we know it, will now be known as “Lightroom Classic CC.” There is a new version called “Lightroom CC” and it's completely new and cloud-based. If you decide to continue using the regular old Lightroom Classic, then not much will change for you. The new version has a couple new features and decent speed improvements. If you decide to ride the wave of the future, then you'll be migrating over to a new program–Lightroom CC. The new version has a Nerfed feature set with a significant number of features missing from what you're used to, but it provides the ability to access your photos from anywhere and any device–all from a really slick interface. Improve Photography's recommendation today is to update to Lightroom Classic CC to get the new features. I have not run into any significant bugs and think it's a worthy upgrade. However, I would not recommend moving to the all-new Lightroom CC just yet. Give it 6 months until we can learn more about what Adobe is planning. What's New in Lightroom Classic CC? Adobe didn't want photographers to freak out about this change, so it developed Lightroom Classic CC a little further. Speed is the number one thing that photographers want from Lightroom. I don't need to tell you how unbearably slow it has run for the last several years. Definitely select this when doing your next import. It's NOT the default. You may not notice a massive change in speed as soon as you update, but when you do your next import, you can use the jpg previews embedded in your raw files for culling. 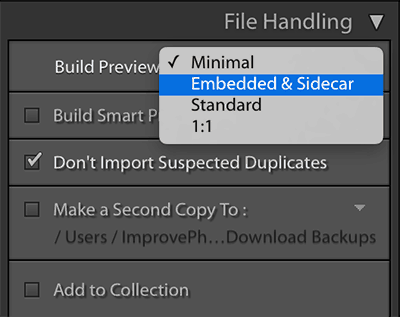 Select the new option for “Embedded and Sidecar” in the import dialogue. Curiously, this is NOT the default. You'll really feel this when you start to cull through your first imported shoot. THANK YOU ADOBE! Scrolling between photos is also significantly faster. It's still not as fast as Photo Mechanic, but it's much better. I did not do any side-by-side testing of import speed, but anecdotally, it does not seem significantly faster, and I still sometimes get hang-ups where the import goes half way through and never finishes. Color masking is a new feature that allows you to apply edits to a range of colors in a certain areas of the photo. I can't think of any major situations where I'd use this, but I'm sure it'll be helpful from time to time. Luminance masking is an AMAZING new feature. If you've tried and failed to navigate the complicated luminosity masking plugins available, you'll love how this is implemented in Lightroom Classic CC. It's not as powerful by any means, but for 75% of the situations where I use luminosity masks in Photoshop, I can now use this–much faster–Lightroom inteface to make the same changes. What's New in Photoshop CC 2018? Not much has changed, but there are a few things that are nice to see. Lightroom CC is the future. Imagine what powerful edits could be done to photos in a cloud-based, machine-learning, AI driven, super robot future! We may need to make sure the machine has a short cord so can't travel far enough away from the outlet to attack us. Some of the future is already here. The all-new Lightroom CC uses Adobe Sensei technology to keyword photos for you. You can search “water” and it will magically find all the photos that have water in them and bring them up. Sweet! What if, when you edit a landscape, the software already knows you're editing a tree against a bright sunset background, and changes the way the tools work to prevent haloing? Or applies skin smoothing automatically when it detects too much texture on the skin, and you just control the amount? What if the liquify brush knew what part of the face you were editing so it could intelligently apply the edit without changing the eye shape? There is no limit to what could be done. Today, however, Lightroom CC really only provides two benefits to Lightroom Classic CC: (1) You get a really pretty and intuitive interface that solves nearly everything that most people struggle to understand in Lightroom (catalogs, backup, import process, etc). (2) You get the ability to offload your entire portfolio onto the cloud and edit them on your desktop, laptop, iPad, or even your phone. Everything in one spot. No tone curve, although Adobe told me they plan to add this back in with a future version of Lightroom CC. They are aware that this is a big miss and I would be surprised if it takes more than 3-4 months to see this added in. The only sharing options are file to hard drive, and Facebook. Keywords from Adobe CC won't pass to Lightroom Classic CC. However, moving from Lightroom Classic CC to Lightroom CC will bring all your keywords and edits. If you're going to stick with Lightroom Classic CC, then there is no change for you. Business as usual. If you plan to move to the all-new Lightroom CC, then you'll pay more (if you have a portfolio of any real size). Here are your options. Jump up to $19.99/month to get this plan with 1TB storage. There's a limited-time promo of $14.99 available to existing customers right now. Not enough storage in those plans? Here are your options for additional storage. It's essentially $10/terabyte/month. EXAMPLE: You're a hobbyist photographer with 20,000 images (about 1tb) and you want both Lightrooms and Photoshop. 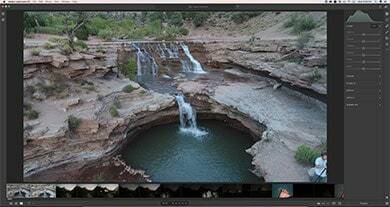 You'll pay $19.99/month if you want to move to the new Lightroom CC workflow. EXAMPLE: You're a serious pro photographer and you want both classic and the new Lightroom as well as Photoshop, and you have 100,000 images in your Lightroom catalog today, that's probably about 3tb of data. You'll pay $59.99/month. EXAMPLE: You are a hobbyist and don't want to pay a dime more. You hate these changes and just want Lightroom as it has always been. Simple. Don't do anything. Stick with your current plan and don't move to the all-new Lightroom CC. Eventually, you'll probably have to move over, but you can probably stay for 3 years or so before Adobe starts pushing us to migrate (just my guess). EXAMPLE: You're a media creator professionally. You need Lightroom and Photoshop, plus all the other Adobe apps, and you have a normal sized portfolio of 6 terabytes which is typical for a professional. You'll be paying $149.99/month. Ouch! I don't see any way around the fact that the future is Lightroom CC. I would be shocked if Lightroom Classic CC is still around in 7 years, but at the same time, I'd be surprised if it were gone in 3 years. They will find ways to bring balance to the force and eventually get us on one platform. I'm okay with that transition. If I were buying Lightroom for the first time today, I'd buy the all-new Lightroom CC. For most of us who already use Lightroom, I'd hold off for 6 months and wait to see how the dust settles. Stick with Classic until the guinea pig (me) tests everything out more fully. Adobe deserves our respect for usually doing the right thing in terms of preserving our ability to keep our photos and edits no matter what program we use. Tom Hogarty of Adobe has stated that there will be (I haven't checked to see if it's yet available) a “punch out” tool to download all images from Lightroom CC cloud along with all the edits and metadata if you choose to end your subscription. The tool will be available for a year after your subscription ends. I'm optimistic about the all-new Lightroom CC. It won't work well for people with a slow internet connection. It costs more. It doesn't have nearly as many features as Lightroom Classic CC. But I do see myself making the transition in the near future. Lightroom Classic CC is mostly business as usual. There's a relatively modest speed bump in the new version, but don't expect it to work as fast as Photo Mechanic or Capture One. It takes the software from nearly unusable (how it has been over the last year), to the point where it's bearable but still not fun.